"somewhere in between the works that I admire"
This resonates because finding "pieces of these writings" that "will talk to each other" is what I try to do too. I have both of Judy Halebsky's books, thanks to my dear friend Linda Collins. Judy is doing a reading this Sunday afternoon (8/7) in Oakland for Poetry Flash, at Diesel, A Bookstore. I collected a few more such (human) friends at the Napa Valley Writers' Conference last week. 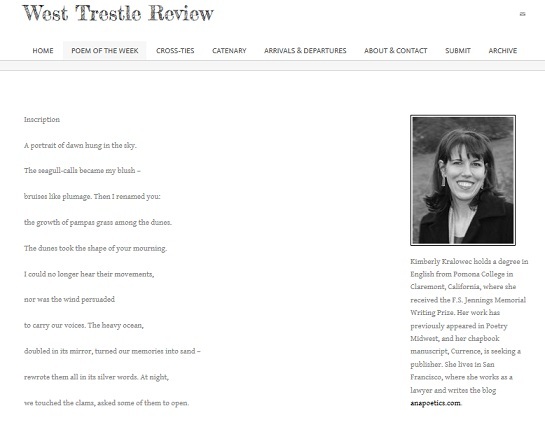 My poem "Inscription" was poem of the week this week at West Trestle Review! After this week, it will be available on the journal's archive page (scroll down). Many thanks to Patricia Caspers for selecting my work -- my first real published poem! -- and for supporting women poets. There is a beautiful poem by Leanne O'Sullivan in the most recent issue of Poetry. The first section, in particular, reminds me of Neruda -- a unique form of Neruda in which the loved one is unwell. "He could not complete the poem. The pattern eluded him." Sylvia, on the other hand, though patently a poet of her "self," was more a surrealist of internals, seeking to reveal the archetypes and patterns working within or behind them. [Her method] was to collect a heap of vivid objects and good words and make a pattern; the pattern would be projected from somewhere deep inside, from her very distinctly evolved myth. "The poet's task ... is to recognize pattern wherever he sees it, and to build his perceptions into a poetic form which by its urgency and coherence will persuade us of their truth." between sets of longer, more challenging poems. of the manuscript they are a part of. Weak poems. You know which ones. Don’t “hide” them inside the manuscript. [Poems] do start with little notes. I keep cheapie notebooks on me at all times, and will sometimes just stop in the middle of walking somewhere to get a thought down. (I find if I don’t write it down as soon as I think it, it just disappears). I don’t ever really sit down and write a whole poem. I sort of build them up over time, riffing on something I’ve jotted down, and coming back to it over and over and adding pieces or taking them out or rewording them. 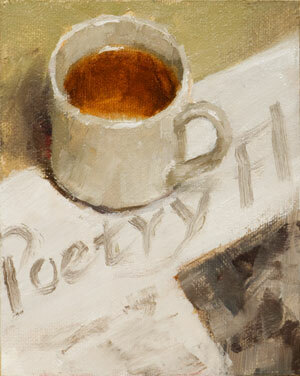 .... It’s about all I can do to keep up with my day job and still write poetry. I mostly write by making use of “interstitial” time—my commute, for example. .... The writing process I’ve developed—that of collaging and remixing notes—has been shaped by time pressure. I don’t really have the luxury of sitting down and thinking about a poem for several hours at a go. The bold part is so true. I've lost a lot of thoughts by thinking I'll remember them later. What's worse is when I remember that something slipped away, but I don't know what. and we don't dance in it anymore. just as a bus pulled up. Some events (selected by some interior mysterious process out of all the other minutes and hours of my life) begin to form themselves in my understanding as phrases, images, rhythms of language, [and] demand to be further formed, demand midwifery is one way to put it. Those moments before a poems comes, when the heightened awareness comes over you and you realize a poem is buried there somewhere, you prepare yourself. I run around, you know, kind of skipping around the house, marvelous elation. It's as though I could fly, almost, and I get very tense before I've told the truth - hard. Then I sit down at the desk and get going with it. 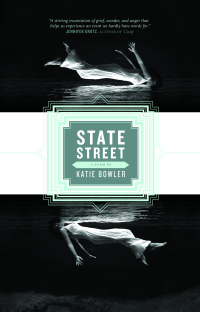 I begin to write when a phrase appears in my head—a word cluster, sometimes a single word. The task is to discover the world or voice from which this fragment can speak or elaborate itself into a story or a personality or a mood. "to say and say and say what more means"
I love and love and love this love poem by Christian Anton Gerard. It has a lot of Cummings in it. there are times when time is ours. Hours. No hourglass exists in your hands. that couldn’t not fulfill me. Only after the fact does your brain check the world to see if its prediction was right. .... [T]he brain is wired for prediction, and you predict most of the sights, sounds and other sensations in your life. You are, in large measure, the architect of your own experience. Dreams and the transitions between different levels of consciousness are suggested by the poet's very name. They are Tranströmer's territory. .... How impressive it is that he has never compromised on his singular perceptions, and that the resulting poetry is so luminous, and has yielded so much meaning to his readers. The great subject of the poetry of Tomas Tranströmer—sometimes it seems as though it is his only subject—is liminality. He is a poet almost helplessly drawn to enter and inhabit those in-between states that form the borderlines between waking and sleeping, the conscious and the unconscious, ecstasy and terror, the public self and the interior self. Again and again his poems allude to border checkpoints, boundaries, crossroads: they teeter upon thresholds of every sort—be they the brink of sleep or the brink of death, a door about to open or a door about to close.